Last week I finished painting some of the Chewks models I have for Khurasan. They were airbrushed initially with the aim of making them look a dark brown colour. The Drill tank itself has a flat drill (not your traditional pointy drill), so is initially a little confusing to view, however it is bursting out of the ground. The Chewk canon is is designed to be mounted onto the side of the drill tank as an extending platform. For the purpose of Gruntz rules it will take one action to deploy the Chewk canon from the side of the tank. The Chewk canon can also be setup as an independent artillery piece in its own right, being pulled by a Chewkamel (shown here in blue). It has two crew and in this unlimbered setup I have placed the Chewkamel beside the canon on the base. You can view unpainted video details on the Chewk tank in my video update here: Chewk Tank details. You are so lucky. I've been chomping at the bit waiting for these since last year. 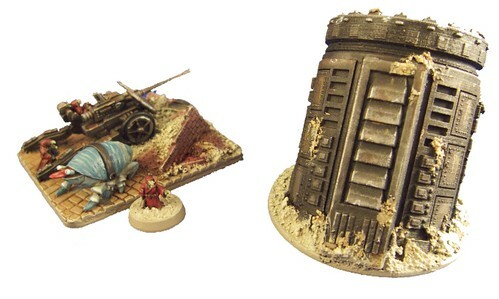 15mm Terrain with practical 40K 28mm usage. A chat with Jon of GZG in regard to some new Moongrunts releases presented at the SELWG wargames show 2016. Copyright 2014 GruntZ. Awesome Inc. theme. Powered by Blogger.